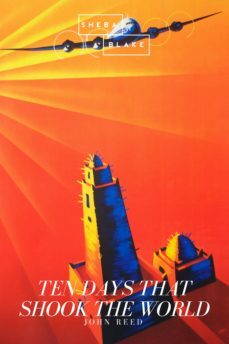 Ten Days That Shook the World (1919) is a book by the American journalist and socialist John Reed about the October Revolution in Russia in 1917, which Reed experienced firsthand. Reed followed many of the prominent Bolshevik leaders closely during his time in Russia. John Reed died in 1920, shortly after the book was finished, and he is one of the few Americans buried at the Kremlin Wall Necropolis in Moscow, a site normally reserved only for the most prominent Soviet leaders. John Reed was on an assignment for The Masses, a magazine of socialist politics, when he was reporting the Russian Revolution. Although Reed states that he had "tried to see events with the eye of a conscientious reporter, interested in setting down the truth" during the time of the event, he stated in the preface that "in the struggle my sympathies were not neutral" (since the book leans towards the Bolsheviks and their viewpoints). Before John Reed left for Russia, the Espionage Act was passed on June 15, 1917, which fined and imprisoned anyone who interfered with the recruiting of soldiers and prohibited the mailing of any newspaper or magazine that promoted such sentiments. The U. S. Postal Service was also given leave to deny any mailing that fitted these standards from further postal delivery, and then to disqualify a magazine because it had missed a mailing and hence, was no longer considered a regular publication. Because of this, The Masses was forced by the United States federal government to cease publication in the fall of 1917, after refusing to change the magazines policy against the war. The Liberator, founded by Max Eastman under his and his sisters private control, published Reeds articles concerning the Russian Revolution instead. In an effort to ensure the magazines survival, Eastman compromised and tempered its views accordingly.